1906 January 5 Prestonlinks Haddington Forth Collieries (1903) Ltd George Davidson 23 Fireman Explosions of fire damp or coal dust See Report, pages 12, 13,14. 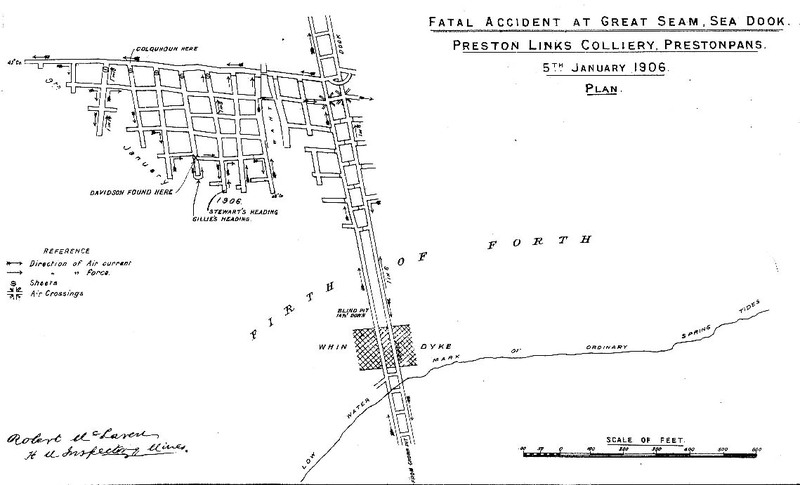 From Main body of report: The most serious explosion occurred at Prestonlinks Colliery, Prestonpans, belonging to the Forth Collieries (1903) Ltd. The place of accident, was in Gillies' heading of Great Seam of Coal, Sea-dook section. The Great Seam is in two divisions, the bottom portion, which is 3 ft. 9 ins. thick, is worked stoop and room, with stoops 20 yards square, and openings 15 ft. wide, the top portion which is not presently worked is about 3 ft. thick and is separated by about 4 ft. strata. The air current to ventilate the seam passes in from the Links shaft by means of a forcing fan 21 ft. by 7 ft., and goes by a parallel dook, part enters the west level and, after ventilating the faces there, passes to the opposite side or east level by air crossings, and after traversing the workings there returns by the haulage road to the Crown shaft. The quantity of air passing in to the west level measured about 2,000 cubic feet per minute. To ventilate the workings the air was conducted to the faces by means of brattice cloth. On the morning of the accident deceased and another oncost-man named John Colquhoun descended the Crown shaft about 5.45 a.m., and both carried naked lights to the station, which was the entrance to the west level ; both naked lights were extinguished after deceased had trimmed and lighted his "Davy" lamp, and both men proceeded by the light of the "Davy" along the level road to a part where a fall had taken place and which Colquhoun was to redd. Deceased passed in to the workings inside, and in passing out to examine the rise places he spoke to Colquhoun, who saw that he carried only the one lamp, namely the "Davy," and shortly after an explosion was heard, and Colquhoun was thrown to the ground. On recovering himself, Colquhoun ran out to the dook road, and met other men coming towards the scene of the explosion. A search party was formed but owing to the presence of after-damp it was found impossible to get to the rise working, and before deceased's body was got the ventilation had to be partly restored. The explosion was very violent, and the direction of force was from X towards Stewards heading, and from Stewart's heading to the dip ; the force was greatest at the latter, props being thrown out and hurled against the stoop's side, the dirt stoppings at the level were thrown on to the level road, and the air crossings were damaged. There were many indications of flame on the props, and on several pieces of paper near the place where deceased's body was found. The deceased's body was found at X with his head to the dip and lying on his face, and close to his left hand was his "Davy" lamp very much damaged ; diligent search was made near X for the remains of a match or an open lamp, but neither was found ; it was stated that the small open lamp which belonged to deceased was found at a tool chest at the station, where it was left by him when he proceeded inbye to make his inspection. The work had only started after the holiday, and during the suspension the roof had broken, causing several falls to take place, and liberating gas from the portion of coal above, as was ascertained by a bore being put up to this coal shortly before the date of accident, when gas issued from the bore hole. The falls deranged the brattice cloth, and some gas accumulated, and deceased in company with Colquhoun cleared out this gas the night prior to the accident. Hitherto the workings had been free of gas, but the close proximity of the whin gaw seems to have altered the conditions causing the strata to become gaseous. The cause of the explosion appears to have been due to the safety lamp; deceased had gone right into a body of gas before he was aware, and an explosion took place in the lamp, causing the gauze to be forced up, and the flame communicated with the explosive mixture outside. 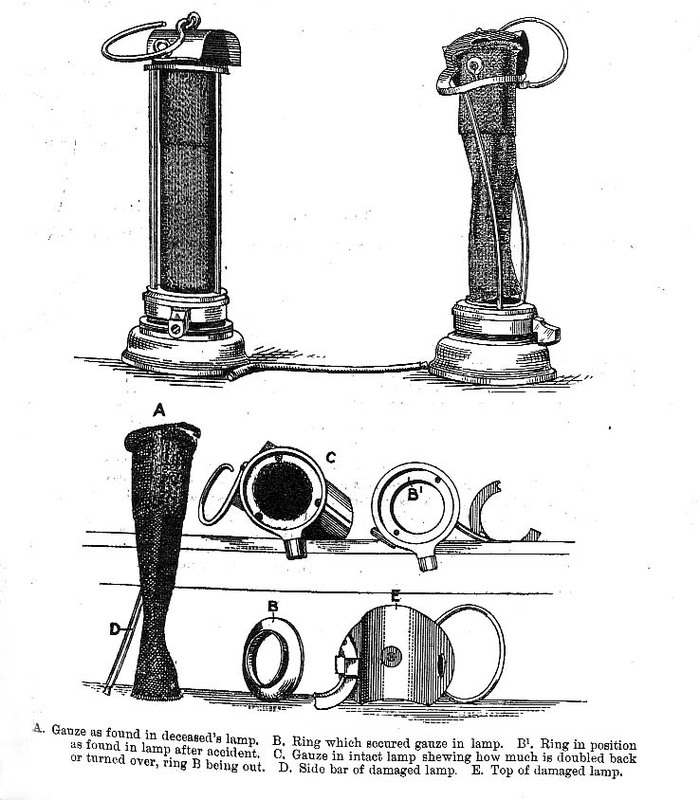 The construction of the safety "Davy" lamp in use was defective, as the bottom of the gauze was not fixed to the ring by rivets, but simply turned over on the ring, the result being that an explosion occurring inside the lamp the gauze would be forced out; an experiment showed that with a very moderate pressure the gauze was displaced from the ring. The plan shows the position of the workings, in section where explosion took place, and drawings show the lamp as it was found, one drawing showing the lamp as carried by the fireman. 1906 January 6 Tannochside No 3 Lanark Archd. Russell Ltd Murdoch Mcleod 31 Haulageman Falls of roof He was, along with a fireman, repairing an airway when the roof gave way and fell on him. 1906 January 8 Kinneil Linlithgow Kinneil Cannel & Coking Coal Co Ltd John Sneddon 59 Miner Haulage  run over or crushed by trams & tubs Deceased worked in the first branch road off a heading, and the part of the heading above in the next place being steeper a "cuddie " was in use. It was the custom for deceased to come to heading road to assist his drawer with the empty tub, and he was sitting on the roadway as usual waiting on his drawer, when the miner in the place above came out with a loaded tub to run it to the heading foot, and failing to attach the " cuddie " chain the tub ran down the heading ; deceased was caught by it and pushed in front for a distance of 10 yards. 1906 January 9 Polmaise No 1 Stirling Archd. Russell Ltd Peter Darrock 16 Hanger-on Haulage  run over or crushed by trams & tubs When at the foot of a self-acting incline he was caught by a runaway hutch which a drawer at the top pushed over the brow of the incline without having attached it to the rope. 1906 January 10 Earnock No 3 Lanark John Watson Ltd John Miller 27 Miner Falls of side Fall of coal while holing ; caused by failure to sprag. 1906 January 15 Balgonie Fife C B Balfour Thomas Nicholson 29 Miner Falls of roof The roof which was coal, was low, and deceased and two others began to heighten and repair it. Deceased was filling a tub when some roof coal fell close by him, and thinking he would be safer inside he ran forward, and just then the roof collapsed and he was buried beneath it. 1906 January 15 Hillhouserigg Lanark United Collieries Ltd Matthew Brown 34 Screenman Deaths not comprised under Mines Act This man had been in failing health and suddenly expired at his work. 1906 January 16 Springhill No 2 Ayr Arch. Finnie & Sons John Crane 41 Miner Falls of roof Fall of roof at working face. Apparently the propping regulations were not observed. 1906 January 17 Altonhill No 1 Ayr J & R Howie Ltd Andrew McLelland 60 Sinker Shaft accidents -things falling from part way down While the overman was lowering a plumb line the iron nut on the end of the line, having been insecurely fastened by him, came off, fell down the shaft and struck deceased on the head. 1906 January 19 Auchinraith No 2 Lanark Merry & Cunninghame Ltd Michael Gainer 45 Miner Falls of side Fall of coal and stone from working face, apparently while holing. 1906 January 19 Montomeriefield Ayr A Kenneth & Sons William Rollo 19 Pithead labourer On surface  by machinery He went among the moving parts of the screeing machinery to put on a belt that had come off the pulleys, and got caught by the driving pulley. From Main body of report: Caused by the deceased going among the moving gearing to attempt to put a belt on. The result was that he got caught by the driving pulley. 1906 January 20 Burnockhill No 1 Ayr Wm Baird & Co Ltd Jose Blanco 25 Labourer Shaft accidents  falling into shaft from surface He opened the gate at the pitmouth, took a hutch off the cage, signalled the cage down, and then pushed an empty hutch into the open shaft and fell after it. 1906 January 20 Dunnikier Fife Walter Herd & Son Ltd George Campbell 20 Miner Falls of side Deceased withdrew a sprag to allow the coal to fall, when it fell across the face for a distance of 15 feet, throwing out two other sprags, and he was crushed beneath the mass. 1906 January 25 Dalbeath Fife Fife Coal Co Ltd William Paterson 52 Miner Falls of roof Deceased was taking coal off the face when the roof collapsed, and he was killed instantaneously. The place was approaching an old working, and the roof was troubled with "waste" breaks. 1906 January 26 Boghead Linlithgow Gavin Paul & Sons Ltd Margt Dunnigan 30 Coal cleaner Deaths not comprised under Mines Act On February 5th, 1904, she met an injury by a hoist cage crushing her. 1906 January 27 Whitrigg Linlithgow R Forrester & Co Ltd Hugh Brannan 29 Miner Falls of side Deceased was holing his coal, and had it holed to a depth of 3 feet for a distance of 8 feet across, when it fell upon him : there were no sprags up to the coal. 1906 January 28 Polmaise No 2 Stirling Archd. Russell Ltd Thos Laird 23 Roadsman Explosions of fire damp or coal dust They were allowed to enter workings which had not been previously inspected by a fireman, and they walked into an accumulation of fire-damp which ignited at their naked lights. From Main body of report: The first fatal explosion took place in Polmaise No. 2 Pit, Stirlingshire, and by it two men lost their lives. It appears that by the instructions of the under manager the deceased and two firemen descended the pit on the morning of the accidenta Sundayin order to make a stable near the pit bottom, and to fit up a signal in the workings of the Hartley seam. These men were joined at the pit bottom by the under manager, who sent the deceased with a safety lamp between them to fit up the signal, and told one of them, his own brother, to make an inspection with it, and then use their open lights. A few minutes after, a violent explosion occurred, and the bodies of the deceased were subsequently found in the level in the Hartley seam, about 150 yards distant from the shaft. This level is the return airway for the section of workings towards which they were proceeding. They were the only persons in that split of air at the time of the explosion, the other three men being at the stable, which was ventilated by a separate split of air. There seems to be no doubt that the deceased carried a naked light with them, and this ignited fire-damp, which accumulated in the workings during the week end, when the speed of the ventilating fan seems to have been reduced one half. 1906 January 29 Bothwell Castle Nos 3 & 4 Lanark Wm Baird & Co Ltd John Martin 26 Drawer On surface  railways, sidings or tramways When crossing the line on the colliery premises he was run over by waggons which were being shunted by the Caledonian Railway Co.'s locomotive. 1906 January 30 Roman Camp (Oil shale) Linlithgow Broxburn Oil Co Ltd James McGuigan 45 Labourer Shaft accidents  falling into shaft from surface There are two levels at shaft on surface, one for shale, the other, 10 feet above, for debris; at the former there are gates at entrance to the shaft, while at the latter a policeman covered the mouth. At the lower level the loaded tubs are taken off the cage at south side of shaft and the empty tubs put on a north side. A loaded tub of debris was raised to the upper level, and deceased who was at the lower level, had instructions to put an empt tub on the cage as soon as it descended. He accordingly passed to the north side with an empty tub, opened the gate and pushed it forward to the open shaft before the cage had reached the level, and tub and he were precipitated to the bottom, a distance of 50 fathoms. 1906 February 3 At two mines irruptions of water took place, one by which five men were entombed for about four days, and the other by which two lives were lost. The first occurred at Tullygarth Colliery, Clackmannanshire, owned by Messrs Jas. Fyfe & Co. The shaft is 61 yards deep to the Splint Coal seam, and at 50 yards it cuts the Cherry Coal seam. The principal workings were at the lower level, in the Cherry Coal, and were reached by a crosscut mine from the Splint Coal, and in the upper level were two working places reached from the mid working. Operations were begun at the colliery in 1900, and as soon as the Cherry Coal was reached, boring was commenced and carried on until the waste of the abandoned workings of Clackmannan Colliery was reached and the water was drawn off, as the workings progressed to the dip, bore holes were put through to the dip waste, and quantity of water was regulated by plugging the holes at intervals, according to the capacity of pumps to deal with it. At the time of the inrush bore holes were running water from the waste at A and B. 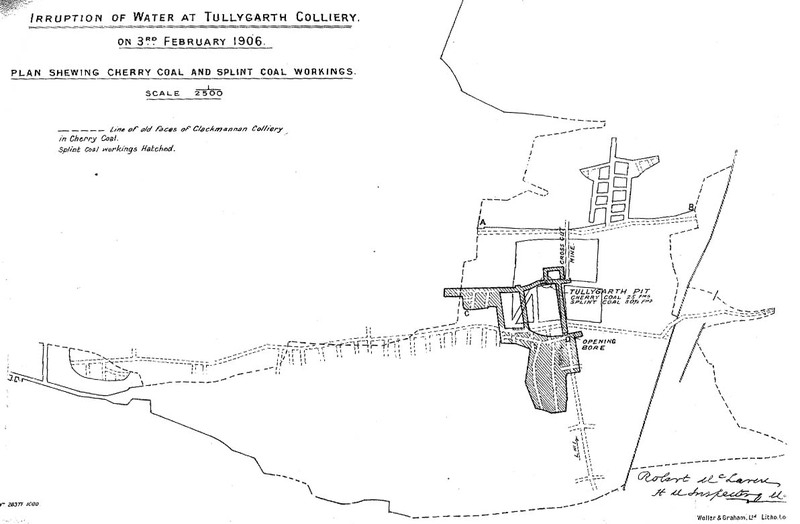 The work was proceeding as usual on the morning of the 3rd February, when water was seen making its way down the "dook " of the Cherry Coal, and as it increased in volume the alarm was raised, and the men rushed toward the shaft, but on reaching the crosscut mine their way was barred by the water, and they had to travel a heading situated inside the crosscut mine and reach the shaft by the upper level ; in the excitement the men at work, five in number, in the Splint Coal were forgotten, and the manager in company with a miner, who volunteered to accompany him, tried to force their way to them by the crosscut, but the current was too strong and they had to retreat. Arrangements were at once made to try and keep the water in check, and to this end the speed of the pumps was increased commensurate with safety, and water chests capable of drawing 50 tons per hour were put on the cages. A telephone message reached my home at 3.30 p.m., and as I was away on inspection duties I got back at 3.50 p.m. and at once proceeded to the colliery, which I reached at 5.15 p.m. Having examined the plan, I descended along with the manager and some officials to the upper level, and by means of "chapping" was able to locate the entombed men in the seam below, at D. As the water continued to rise in the shaft it was decided after consultation with the manager to put down a bore hole, and by it to lower food and light until they were rescued, and to effect a rescue to make an opening between the seams ; the bore hole was completed early on the morning of the 5th, and after communicating with the men below it was discovered that only three were present and by "chapping" the two others were located further to the dip. To reach these men a mine was started in the strata, but this was finally abandoned when the opening was made. The men worked in the level, and when they discovered that the water had cut off their escape by the shaft they went to the rise workings, where work was discontinued about six months before, and the roof had fallen almost close to the coal face, and they were unable to proceed further either to right or left, and were compelled to remain on the roadway at C. To reach the men and effect a rescue the fallen face had to be cleared for a distance of 24 yards, and the party resolutely set to work to accomplish this ; the work was progressing satisfactorily when carbonic acid gas made its appearance, caused in a great measure by the oxygen in the limited area being consumed by the burning of the lights and breathing of the men, and for well nigh three hours a struggle ensued between determined workmen on the one hand and the foul atmosphere on the other, and it looked as if the workmen would be defeated and the poor fellows left to perish, when a cylinder of oxygen under pressure was obtained and taken to the place and by means of an india-rubber tube the gas was allowed to escape, the effect being that the entombed men, now much exhausted, were revived, and the atmosphere sufficiently cleared to permit acetylene lights to burn, and in a short time the rescue was accomplished, not a moment too soon as in less than two hours the black damp was at the top of the opening. During their confinement the men were in dire straits, as the water was at one time 1 foot 6 inches from the coal face, and to sit up straight, stones were placed in the water and their heads forced into the recess made in the fallen roof; the younger man prior to his light going out on the night of the 4th, wrote a farewell letter on a stone to his friends. While the work of rescue was going on, either myself, Mr. Whalley, or Mr. Carey were present. The quantity of water which found its way into the working was estimated at 3,000,000 gallons. 1906 February 8 Lumphinnans Fife Fife Coal Co Ltd William Shaw 48 Miner Falls of roof Deceased was taking down a "fallen" overhanging-the face when thereof fell upon him. 1906 February 9 Chapel Lanark Chapel Coal Co Ltd Benjamin -------- 33 Miner Falls of roof Deceased was wedging down coal at the roadhead when the roof fell away suddenly upon him; in its descent the stone threw out a prop which supported it. 1906 February 12 Cowdenbeath No 10 Fife Fife Coal Co Ltd Alexander Michie 27 Shunter On surface  railways, sidings or tramways Deceased had removed some empty waggons into a siding and fouled the crossing, and while riding down with a second train, on the brake of one of the waggons, he was thrown off and crushed between the buffers. 1906 February 16 Portland No 4 Ayr Portland Colliery Co Ltd Charles Currie 50 Brusher Miscellaneous underground  by explosives Struck by a stone projected by a gunpowder shot. He failed to take proper refuge. The accident was not reported and he died on 26th July. 1906 February 16 Ellismuir No 3 Lanark United Collieries Ltd Gavin Wilson 29 shaftsman Shaft accidents  miscellaneous When working at a mid-working he put his head out into the shaft and the descending cage struck him. 1906 February 23 Portland No 8 Ayr Wm Barr & Sons Samuel Taylor 35 Miner Miscellaneous underground  suffocation by natural gases In trying to get his tools out of a place full of black-damp he was suffocated. From Main body of report: In Portland No. 8 Pit, Ayrshire, a miner lost his life by knowingly entering a body of black-damp. He had been engaged driving a "dook" through old pillars, but just as the face of his working place was nearly through a pillar, black-damp, which the air current was unable to dispel, caused him to retreat, and he and his brother were given another working place 600 yards distant. Eight days after being put out by the black-damp, the deceased without sanction, and without informing any one went into his former working place, apparently to attempt to get out some tools which he had left at the face. His brother, when he failed to come to his working place, went in search of him, and his body was found about 8 yards from the face of the dook. His lamp and jacket he had hung up at a point above where the black-damp extended. 1906 February 26 Michael Fife Wemyss Coal Co Ltd James Thomson 45 Repairer Haulage  ropes or chains breaking Deceased and some others were repairing a steep heading which was worked as a chain brae. In order to get empty tubs to the place where repairs were being made a weighted tub was put on one end of the chain and the empty on the other, and both tubs were on the one line of rails causing the chain to cross, and while the chain was in motion one link caught another, causing a break, and tubs ran back and knocked out some timbers and the roof fell. 1906 February 27 Michael Fife Wemyss Coal Co Ltd Mary Lynch 15 Coal cleaner On surface  by machinery Deceased worked at the picking table, and she appeared to have stood on the bar of a fence, and overbalancing fell on a revolving shaft which caught her clothing, and she was wound round and crushed. 1906 March 6 Giffnock Renfrew Giffnock Collieries Ltd David Keir 35 Pump attendant Shaft accidents - falling from part way down He fell to the pit bottom in some unexplained manner from a stage in the shaft where a steam pump was placed. 1906 March 12 Lochore Fife Fife Coal Co Ltd James McCall 38 Leading Sinker Shaft accidents - falling from part way down Deceased and another sinker were engaged in a sinking shaft repairing a pump, and were on a scaffold while doing so, when by some unknown cause he fell into the shaft to a scaffold 40 fathoms below and was killed. 1906 March 21 Armadale Linlithgow United Collieries Ltd John McLean 30 Roadsman Falls of roof A fall occurred on the main haulage road during the night, and deceased and others were engaged redding it with a view to make repairs, when a large stone from behind the area of the fall came away, swinging out the crown which supported it, fatally crushing both men. 1906 March 22 Bothwell Castle No 4 Lanark Wm Baird & Co Ltd Henry Powell 18 Drawer Falls of roof Fall of roof from brushing face. It was said that the fall displaced two props and a crown. 1906 March 26 Earnock Lanark John Watson Ltd Wm Calder 31 Waggon trimmer On surface  railways, sidings or tramways When between two waggons, at the screes, shovelling coals, the waggoner brought forward other waggons which moved one of the standing waggons, and he was caught between the buffers. 1906 March 27 Auchincruive Colliery, Mossblown No 2 Ayr Auchincruive Coal Co Hugh Corrigan 42 Miner Falls of roof Fall of roof in working place. 1906 March 28 Sheriff yards Clackmannan Alloa Coal Co Ltd James Forsyth 32 Miner Deaths not comprised under Mines Act A fall of coal took place and injured this man's spine, in October, 1902, from which injury he subsequently died. 1906 March 28 Leven Fife Fife Coal Co Ltd Thomas Taylor 45 Labourer Deaths not comprised under Mines Act While filling coal into tubs at the bing he dropped down dead. 1906 March -- Cults (Limestone) Fife Trustees of the late James Martin John Donaldson 41 Miner Metalliferous mines  falls of roof The seam is 12 feet thick, and at the place of accident the bottom 4 ft. had been taken out right across the opening, which was 19 feet wide. The remaining 8 feet in two beds was cut out on one side, and a shot was fired on the other side to relieve it, but the rock failed to come down. Deceased and his neighbour went under it with bars to lever it down, when the whole mass fell pinning him to the ground causing injuries to which be succumbed. 1906 April 2 Newcraighall Edinburgh Niddrie & Benhar Coal Co Ltd James Aitken 25 Drawer Haulage  run over or crushed by trams & tubs Deceased's duties were to put on and take off tubs at the foot of a self-acting incline 270 feet long. A full tub was standing on the blocks at the top, and the blocks, which had not been properly set, slipped and the tub ran away, and on reaching the bottom struck deceased causing injuries to which he succumbed an hour later. 1906 April 3 Ellismuir Lanark United Collieries Ltd Thos Craigie 75 Waggon greaser &c On surface  railways, sidings or tramways While oiling the siding points he was run over by two waggons and a Caledonian Railway Co.'s locomotive while shunting Apparently the whistle was not sounded before the locomotive was started. 1906 April 3 Blairmuckhill Lanark A & G Anderson Nathaniel Blair 20 Labourer On surface  miscellaneous A boiler was being raised into position by screw jacks placed under the boiler and inside the seat, and while doing so it tilted slightly ; deceased, who was working one of the jacks, made a rush at an opening to get outside, and was fatally crushed between the boiler and side of brickwall of seat. Had he remained where he was he was perfectly safe. 1906 April 7 Dalkeith Edinburgh A G Moore & Co William Jackson 17 Trimmer On surface  railways, sidings or tramways Deceased appeared to have been on the moving waggons, and in jumping down to regulate the speed by the brakes he stumbled and fell and waggon crushed him. 1906 April 11 Bothwell Castle No 2 Lanark Wm Baird & Co Ltd Thos Stevenson 25 Jigger Miscellaneous underground  by machinery When passing a haulage tension carriage he got caught by the pulley. He had been prohibited from going there. 1906 April 13 Loganlea Edinburgh United Collieries Ltd Peter Higgins 34 Miner Falls of side The bottom portion of the seam - main coal - is taken out first and the upper portion left on and supported by props for several feet, after which it is worked off. Deceased had 10 feet of the upper portion on, and was preparing to take out more bottom coal when a part of the upper portion came away, and, striking him, killed him instantaneously. From Main body of report: In the No. 1 pit of Lumphinnans Colliery, Fife, a fire broke out in the Lochgelly Splint Coal seam, about twelve years ago, and at the time the section was built off by brick stoppings, and up to within a few days of the accident had given no trouble. The No. 1 pit was downcast and the air passed on the dip side of the stoppings toward the No. 11 pit. It appeared that three days before the accident a smell of coal stinkwell known as a product off a coal firewas felt, and at once men were sent to look over the stoppings and make repairs and put in new stoppings where such were necessary. On the morning of .the accident several men were engaged at the stoppings, when one burst out between D and A, and a volume of carbon monoxide was projected into the airway, fouling the air current to such an extent that it was with difficulty the men got back to the intake side of D ; the foul air was carried by the current right to the upcast shaft, and deceased who were doing some repairs on the roadway in the workings of No. 11 pit were right in its way and their escape was an impossibility. In reaching the upcast shaft the foul air had to pass the stables, and all the horses, eighteen in number, were overcome as well as the men in the vicinity of the shaft, more or less ; as soon as possible the air current was cut off by means of stoppings in mines leading up to Lochgelly Splint Coal seam on No. 1 pit side and a fresh air current was obtained from the same pit in a lower seam, the Five Feet Coal, and taken into the section and carried the reverse way than the way originally, the result being that several horses revived. Rescue parties were formed to reach the unfortunate men, and as a precaution birds in cages were carried by the men in advance and as soon as the birds showed signs of collapse a halt was made until the foul air had been carried away in front and a further advance made possible ; great difficulty was experienced in reaching the deceased, who were found after 18 hours' arduous work. The Lochgelly Splint Coal seam is liable to fire by spontaneous combustion, and fires are not uncommon ; the fire usually begins in the upper portion. In the section where burst took place the system of working was longwall, and owing to the approach of other workings to the seat of the fire the strata became broken and air was drawn through the crevices, causing a renewal of the fire. As the coal was distilled gas was produced and, prior to the accident, was ignited at one of the stoppings; it is very probable that an explosion of gas took place inside, throwing out the stopping. In trying to reach the bodies the search parties were more or less affected by carbon monoxide as the side roads and openings in the strata were filled with the gas ; at one place great difficulty was experienced in taking fresh air in at a junction of two roads owing to the broken strata, and a tunnel made of brattice cloth had to be formed. 1906 April 29 Muiredge Fife Wemyss Coal Co Ltd James Izatt 34 Labourer Deaths not comprised under Mines Act While suffering from despondency he jumped into the colliery pond and committed suicide. 1906 April 30 Dumbreck Stirling Wm Baird & Co Ltd Alexr Scott 40 Labourer On surface  miscellaneous A scaffold was being erected on the dirt bing. He stepped upon a plank which had just been sawn through and fell 20 feet. 1906 April 30 Blairenbathie Kinross Fife Coal Co Ltd William Haxton 49 Miner Falls of roof Deceased was redding a roadway which had been temporarily stopped, and was forming a building with the fallen debris, when a stone fell from the roof and crushed his head against the partly formed building. 1906 May 1 Bowhill Fife Bowhill Coal Co Ltd George Ross 39 Pit bottomer Shaft accidents  miscellaneous Deceased was engaged loading the deck of the cage which held four tubs, and while doing so the cage was suddenly lifted and he was carried up the shaft and crushed. The cage had not been signalled to ascend. 1906 May 1 Lassodie Fife Thos Spowart & Co Ltd Thomas Haddow 42 Brusher Falls of roof Deceased was in the act of setting timber to the roof of a roadway which he had just brushed, when a stone fell and struck him between the shoulders. His injuries proved fatal on 23rd January, 1907. 1906 May 2 Herdshill Lanark Coltness Iron Co Ltd John Quigley 65 Miner Deaths not comprised under Mines Act Quigley complained to his neighbour on starting work that he felt ill, and latterly left the face and went to the roadhead, and in a short time expired. 1906 May 4 Duddingston (Oil shale) Linlithgow Oakbank Oil Co Ltd Thomas McLean 15 Haulier Haulage  run over or crushed by trams & tubs Deceased's duties were to detach the empty tubs from the endless rope-chain attachment; he tried to attach the chain to a loaded tub contrary to orders, when he was overtaken by another loaded tub coming up from another bench and dragged some distance, receiving injuries which terminated fatally two hours later. 1906 May 6 Whitehill Edinburgh Lothian Coal Co Ltd John Walker -- Repairer Deaths not comprised under Mines Act While proceeding from the shaft to his work he complained of feeling unwell and shortly afterwards expired. The child had wandered to the colliery sidings where shunting was going on, and was run over by the waggons. 1906 May 10 Little Raith Fife Lochgelly Iron & Coal Co Ltd Thomas Porteous 30 Hanger-on Haulage  ropes or chains breaking Deceased hung three tubs on to the rope at the foot of an incline and gave the signal ; when the rake had proceeded about 28 feet the rope broke and tubs ran back, fatally crushing him. 1906 May 17 Ingliston (Oil shale) Edinburgh Young's Paraffin Light & Mineral Oil Co Ltd John Hunter 37 Miner Miscellaneous underground  by explosives Two shot holes were bored in the shale, charged with 1 ½ pounds of gunpowder and white tape fuse used; one shot was in the centre and one in bottom. Both shots missed, and after waiting 40 minutes deceased returned and withdrew the stemming of the former, re-charged the hole and fired it. Later on he was unramming the latter when the charge exploded. 1906 May 18 Kirkwood Lanark United Collieries Ltd Francis Haley 20 Miner On surface  railways, sidings or tramways When passing between two standing waggons, a third moving waggon struck one of them, and he was crushed between the buffers. 1906 May 25 Donibristle Fife Donibristle Colliery Co Ltd David Campbell 29 Miner Falls of roof Deceased worked in a longwall face where two "lypes" ran parallel with the face ; he was instructed to work from one end and take " cut" coal with him and timber as he went; instead, however, he worked in front, and when the coal was taken off, the "lypes" were relieved and the roof fell upon him. 1906 May 26 Bog, Nos 1 and 2 Lanark Hamilton McCulloch & Co Ltd William Stirling 42 Miner Miscellaneous underground  by underground fires Overcome by the fumes of an underground fire. From Main body of report: At Bog Colliery, Lanarkshire, two men lost their lives by the fumes of an underground fire. It appears that fire due to spontaneous combustion broke out in a section of the Ell Coal worked by the "stoop and room" method, and steps were taken to attempt to isolate the fire by putting in stoppings. The manager stated that he gave instructions to put in stoppings at a certain point from which the air went towards the seat of the fire, and a shift of six men, one of whom was the fireman in charge, started to put in the stoppings. Owing to some misunderstanding, they commenced to put in a stopping at a point towards which the air would tend to drive out the fumes from the fire. Before the stopping was completed several of the men were affected more or less by the fumes, but four of them remained and completed this work, and were about to retire when three of them, one after the other, fell insensible. Some 2 1/2 hours elapsed ere the bodies could be got out. One man was dead, and another died two days after, while the other (the fireman) recovered. This accident appears to have been due to the men's ignorance of the deadly nature of the carbonic oxide gas given off by an underground fire. Had they known this, they would have retreated when first they noticed the fumes coming out on them. 1906 May 28 Arniston Edinburgh Arniston Coal Co Ltd Alexander Munro 22 Attendant on coal cutting machine Miscellaneous underground  sundries Report, page 19. 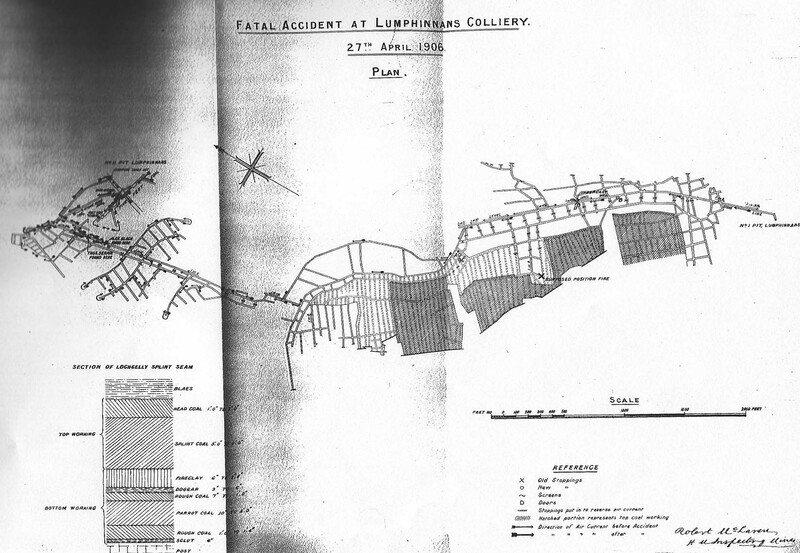 From Main body of report: The first took place at Arniston Colliery, Edinburgh. Preparations were being made to begin the "cut," and this necessitated renewing the the picks on the disc. To enable this to be done the current was switched on sufficient to cause disc to revolve the distance between the picks ; while this work was in progress a slight shock was felt just as the current was put on, and the leakage ran up the haulage rope which deceased was getting in order. He shouted to the man at the switch handle to switch off, which had already been done, and after a word to his companions he fell forward and became unconscious. He was at once removed to the nearest road, and artificial respiration applied for fully two hours, but he succumbed. The other men working about the machine felt the shock, but it was so slight that they compared it to a "jag," and they were none the worse. A thorough test of the machine, cables, &c., by a galvanometer failed to discover the defect. The voltage was 450, and current was continuous. 1906 May 28 Mossbank Lanark John Horn & Co John Allan 40 Miner Deaths not comprised under Mines Act While waiting on the pithead to descend the shaft he suddenly expired : he had been ailing for some time and was under medical treatment. 1906 May 29 Bowhill Fife Bowhill Coal Co Ltd Alexander Mathieson 33 Drawer Haulage  run over or crushed by trams & tubs Deceased put a tub on to the rope at the foot of a short brae, and another drawer put a loaded tub on at the top end and pushed away ; as soon as the latter applied the brake to the wheel the axle broke and tubs ran back, and deceased was shouted to to stand clear ; he evidently mistook the shout and stepped in front of the runaway tubs. 1906 May 30 Castlehill Lanark Shotts Iron Co Ltd John Pender 65 pitheadman Deaths not comprised under Mines Act Deceased, who was an engineman prior to taking up duties as a pitheadman, worked an extra shift on the engine in place of the engineman who was off work, ill, and just as he was being relieved he suddenly expired through heart failure. 1906 June 2 Glenboig (Fire clay) Lanark Glenboig Union Fireclay Co Ltd Joseph Wallace 44 overman Explosions of fire damp or coal dust See Report, pages 12, 13,14. From Main body of report: This explosion occurred in a cross-cut mine being driven over an upthrow fault of 7 fathoms. The mine had a rising gradient of 1 in 4, and was up a,distance of 140 ft. The air current to ventilate the mine was that which traversed the workings, and it was led up to the face by brattice cloth, the intake being on the hutch way and the return on the "cuddie" way, the system of haulage being "cuddie" brae. At the foot of the mine was a pump driven by a haulage rope and wheel, and the night prior to the accident the pump, got out of order, necessitating repairs. To enable the repairs to be done part of the bratticing had to be removed, the result being that the air short circuited and gas collected in the mine. On the morning of the accident, the fireman found gas, and to prevent anyone approaching he put up a fence across the entrance and wrote in chalk ''Gas found in mine," and at the station he warned the men who worked in the ordinary places near by. Deceased and two workmen went to the mine some time after to restore the ventilation by fixing up the bratticing, and of necessity took down the fence, and while he apparently was busy the one man sent the othera Poleto look for some tools, and he wandered up the mine and ignited the gas with his naked light, causing an explosion. The explosion was very violent, as, in addition to destroying the bratticing and knocking out props, several men in the vicinity were thrown down, deceased, who appeared to have been in the direct line of the force, being thrown against a stoop side and killed instantaneously. 1906 June 4 Tannochside No 3 Lanark Archd. Russell Ltd Jas Gillon 51 Miner Falls of side Fall of coal while holing ; caused by failure to set sprags. 1906 June 5 Newbattle Edinburgh Lothian Coal Co Ltd Thomas Kerr 46 Haulage engineman On surface  by machinery A haulage engine on the surface works a band rope led down the shaft and connected to machinery in a clutch house in bottom where there are three sets of clutches for three sets of haulage systems. The engine was signalled to stop, and deceased did so while the strain was at its greatest owing to the gearing of the three systems being in ; while the engine was at a standstill he began to clean out one of the crank pits, and, unknown to him the strain was relieved by the clutchman throwing one of the systems out of gear, causing the engine to move slowly, and crank came round and crushed deceased. 1906 June 7 Minto Fife Lochgelly Iron & Coal Co Ltd George Bremner 32 overman Haulage  ropes or chains breaking The descending tub stuck on a self-acting incline while it was moving down, and deceased went behind and "stamped" the chain, the result being that the chain broke and the tub above ran him down. 1906 June 8 Carberry Edinburgh Edinburgh Collieries Ltd Hugh Forsyth 29 Attendant on coal cutting machine Miscellaneous underground  by machinery A coal cutting machine of the disc type was in use, and the length of the "run" was 120 yards on an inclination of 1 in 3. In order that the machine should feed itself while cutting, a rope goes round a pulley fixed to a prop by a gabby and chain, one end of the rope is attached to the machine and the other end winds round a drum on the machine. Deceased, as leading man, was in front of the machine, and while it was cutting to the rise the gabby broke and pulley came down with terrific force and striking his head fractured his skull. The gabby was made of best iron 1 1/8 in. diameter, and did not appear to be defective. 1906 June 14 Blairadam Fife Fife Coal Co Ltd Thomas Stark 35 Brusher Falls of roof Deceased was driving a road through old waste to reach a section of coal when the roof suddenly fell upon him. 1906 June 15 Herdshill Lanark Coltness Iron Co Ltd James Hendry 33 Miner Falls of roof Deceased was taking off coal at the "nose" corner of the face when the roof suddenly fell away from a "waste" break. 1906 June 22 Highhouse No 1 Ayr Wm Baird & Co Ltd Robert Miller 20 Roadsman Falls of roof Fall of roof on old road while withdrawing props. From Main body of report: Happened to two roadsmen who were engaged in drawing props from an old road 12 feet wide. They had drawn a large number, but were taken by surprise by a sudden fall of roof which knocked out the props which in an ordinary case would have protected them. Fatal accidents by falls while drawing timber are not of frequent occurrence in the district. 1906 June 25 Dumbreck No 2 Stirling Wm Baird & Co Ltd Andrew Burke 23 Drawer Falls of roof Fall of roof on a road while putting a hutch on the rails. 1906 June 25 Lumphinnans Fife Fife Coal Co Ltd Richard Sneddon 51 Miner Falls of side While holing his coal a piece fell away and crushed him ; he died from his injuries 11 days afterwards. 1906 June 27 Saline Fife West of Fife Coal Co Ltd James Shearer 56 Brusher Falls of roof Deceased and his neighbour were about to make some repairs, and while he was preparing to set a prop part of the roof fell and injured his foot; he died from the effects of the injury on 25th September, 1906. 1906 July 2 Dechmont No 2 Lanark Archd. Russell Ltd Wm Dedrenski 23 Miner Falls of roof Fall of roof in working place. 1906 July 2 Riddochhill Linlithgow Gavin Paul & Sons Ltd James Forrest 38 Miner Falls of side Deceased and his son were engaged taking away a corner of coal from a pillar to enable a "cuddie" prop to be set, when a part suddenly burst off and crushed him ; a sprag which was up to the coal was thrown out by the falling coal. 1906 July 5 Rosehall No12 Lanark R Addie & Sons Collieries Ltd Patrick Ferris 49 Miner Falls of side A fall of stone from the brushing face slightly injured his knee. An operation was afterwards found necessary, but blood-poisoning resulted and he died in April, 1907. This accident was not reported to me. 1906 July 6 Mossbeath Fife Fife Coal Co Ltd Daniel Costello 15 Filler Other haulage accidents Deceased's duties were to fill the tubs with coal and otherwise assist at the face; he had filled his tub, and left it at the face and sat down a short distance away to wait on the drawer coming inbye with an empty. While waiting a burst of coal took place off the face, which struck the loaded tub, causing it to move away, and the boy, thinking apparently to get out of harms way, from the falling coal, darted to the opposite side of the roadway and was struck by the tub as it passed. The road dipped 1 in 7 from the face, and it was quite evident the tub was neither spragged nor ranced properly. 1906 July 7 Craigend Fife R Forrester & Co Ltd Donald McPherson 39 pitheadman Shaft accidents  falling into shaft from surface When the descending cage left the surface, the gate which closed the opening stuck, and deceased allowed it to remain, leaving the side unprotected; when the ascending cage came to the surface he took off the loaded tub, and in bringing forward the empty tub he pushed it into the open side and fell into the shaft with the tub. 1906 July 12 Whitehill No 2 Ayr Wm Baird & Co Ltd John J Wallace 14 Drawer Other haulage accidents He pushed two full hutches over the brow of a self-acting incline after attaching the rope. The empty hutches either were not attached or became detached, and he was struck on the head by the hook on the end of the rope when it reached the top. 1906 July 16 Wallyford Edinburgh Edinburgh Collieries Ltd James Millar 22 Labourer On surface  railways, sidings or tramways In stocking coal on the "bing" an incline plane was in use, the loaded tub in descending pulling up the empty ; a loaded tub was ready to descend, and it was pushed away without the hook of the rope being attached, the result being that it ran away, and on reaching the bottom of incline it struck an electric pole, throwing it down, and in its fall it struck deceased. 1906 July 18 Rosie Fife Wemyss Coal Co Ltd David Henderson 52 Labourer On surface  railways, sidings or tramways Deceased was emptying dross from a waggon into the boiler fire-hole, and while doing so another workman allowed a waggon to come down towards the one in which he was, and, seeing that there was likely to be a collision, he jumped and fell across the rails, the waggons running over him. He died eight hours later. 1906 July 20 Longriggend Lanark Nimmo & Co Ltd James Penman 56 Miner Falls of roof While deceased was engaged taking off "cut" coal the roof suddenly fell upon him. 1906 July 26 Bowhill Fife Bowhill Coal Co Ltd George A Leitch 14 Drawer Falls of roof Some bars of long timber were placed across the tubs on a rake going up an incline, and when the tubs reached the top the ends struck some crowns, displacing them and causing the roof to fall upon deceased while he and others were about to unload the bars. 1906 July 31 Newbattle Edinburgh Lothian Coal Co Ltd James Tully 56 Trimmer On surface  railways, sidings or tramways Deceased left his work and crossed some lines of rails for some purpose, and while passing under the waggons on the through line a locomotive engine belonging to the North British Railway Company pushed a train against those standing, and they moved forward and ran over him. 1906 August 1 East Plean No 3 Stirling Plean Colliery Co Ltd Jas McCallum 17 Labourer On surface  miscellaneous He appears to have stepped upon the top of dross in a hopper which was drawn off at the bottom. Apparently a cavity had formed at the bottom, and his weight caused the arch thereby formed to give way. He was drawn in and suffocated. 1906 August 3 Blantyre Lanark Wm Dixon Ltd John McKinlay 72 Gate keeper On surface  miscellaneous When standing at his post at a level crossing he was run into by a cyclist who lost control of his machine. Court of Session  First Division - Tuesday, January 22, 1907. WORKMEN'S COMPENSATION CASEDIVISION OF OPINION. The Division gave judgment in an appeal by way of a stated case in an arbitration before Sheriff-Substitute Thomson, under the Workmen's Compensation Act, in which Mrs. MacKinlay, widow of the late John MacKinlay, Douglas Cottage, Auchinraith, Blantyre, claimed damages from William Dixon (Limited), coalmasters, Blantyre, for the loss of her husband, who was fatally injured on August 3, 1906, while in the defenders' employment. The Sheriff-Substitute found that as an essential adjunct to the working of the collieries a private branch line of railway connects them with the main railway lines. The deceased was employed by the appellants as a gatekeeper at the gates which guard the branch railway at a point about 290 yards from the nearest of the collieries where the railway is crossed by the public highway at the foot of the Sides Brae. While the deceased was leaning on one of the gates waiting for an engine and waggon to pass on, a cyclist, who, on account of the steepness of the brae, had lost control of his bicycle, dashed into the gate with such violence that the deceased was thrown back upon the engine and waggons and was killed. The Sheriff-Substitute found for the pursuer, and awarded her £150 compensation. The questions of law for the opinion of the Court were :(1) Was the place where the accident occurred on, in, or about a mine within the meaning of the Workmen's Compensation Act, 1897, and (2) Did the accident arise out of, and in the course of, the deceased's employment within the meaning of the Act ? Lord Pearson said he had no doubt that the accident arose out of and in the course of the deceased's employment as gatekeeper, as what happened was one of the risks incidental to the employment. His Lordship should have had difficulty on the other point in sustaining the respondents' -contention that the accident happened in or about a mine, but that Section 7 of the Act provided that a "mine" meant a mine to which the Coal Mines Regulation Act applied. In that Act a mine included tramways and sidings adjacent to the mine. It was a question of construction whether that was imported into the Workmen's Compensation Act, and his Lordship thought it was. A mine included a siding provided it was adjacent to or belonged to the mine, and this branch railway fulfilled that condition. Lord Kinnear said the question was one of considerable difficulty. If it were open his Lordship was not certain that he should have been able to come to the same conclusion as in fact he had done with Lord Pearson, but he thought it was governed by the Second Division decision in Anderson v,. Lochgelly Iron Company. His difficulty was whether a branch railway of this kind was a railway to which the Coal Mines Regulation Act applied. It was decided by the case to which he had referred that it was such a sidingnot only a siding in the sense of definition, but a siding to which the Coal Mines Regulation Act applied ; and the moment that was decided, then the question whether the particular line of rails in question was or was not a siding in the sense of the statute was a mere question of fact. It was decided as a question of fact by the Sheriff-Substitute, and he agreed with the Sheriff-Substitute. The Lord President had a clear opinion in the opposite sense to that .expressed by their Lordships. The Workmen's Compensation Act was not universal in its application, but was only applied to certain specified places. So far he understood their Lordships agreed with himthat was to say,. if there were nothing else they would not hold that the accident, which took place where the branch line crossed the public road, nearly a quarter of a mile from the mine, was an accident which happened in, on, or about a mine. But what their Lordships passed their judgment upon was upon the definition of a mine in the Coal Mines Regulation Acta mine for the purpose of the Workmen's Compensation Act, meaning a mine to which the Coal Mines Regulation Act applied. It was perfectly true that a siding commonly denoted a branch railway, because it was being looked at from the point of view of the railway. The Act they had to refer to was not a railway Act, but the Coal Mines Regulation Act; and the first purpose of that Act was to apply various rules, all pointing in one directionto the safety of the worker in the coal mine. It did not look upon the matter from the railway point of view at all. Railway connection between a coal pit and a railway was not a necessity,, and did not exist in many cases. In this case the railway line was not a siding adjacent to the mine, or had anything to do with the congeries of apparatus which were to be found at the pithead. It was a branch railway, and nothing else, for the traffic in minerals. His Lordship understood that Lord M'Laren agreed with him in the ordinary case. Inasmuch as the decision in the Second Division in Anderson's case was by a majority of one in a Court of three, he should have had this case reconsidered by a higher Court; but in view of the new Workmen's Compensation Act, which was passed a few weeks ago, the question for the future really became academic, because the phraseology was so-altered that this question would never arise. In these circumstances, it would not be fair to the litigant here to send the case to seven judges for the determination of an academic question. He recognised that the case was ruled by the case of Anderson, in regard to which his Lordship said he agreed in tne opinion of the Lord Justice-Clerk, who formed the minority. Lord M'Laren agreed with his Lordship in the chair. Counsel for AppellantsMr. Wilson, K.C., and Mr. Strain. Agents - W. and J. Burness, W.S. Counsel for RespondentMr. Orr, K.C., and Mr. Moncrieff. Agents - Simpson and Marwick, W.S. 1906 August 6 Dalbeath Fife Fife Coal Co Ltd Robert Bishop 50 Miner Other haulage accidents A dock haulage endless rope system had just started, and the son of deceased, by some means, was caught by the rope and drawn towards the wheel at the inbye end, and deceased went to release his son and his leg was caught and crushed apparently by the revolving wheel ; he died from his injury on 24th September. 1906. The wheel was under water and not sufficiently fenced. 1906 August 6 Bothwell Castle No 1 Lanark Wm Baird & Co Ltd Charles Russell 24 Painter On surface  by machinery He was crushed by the bell crank of the pumping engine, which was started while he was preparing to paint the logs on which it is set. From Main body of report: Happened to a painter who was painting the wood work about the pithead. The pumping engine stopped of its own accord, seeing which the deceased, without consulting any one, went below the bell crank to prepare to paint the wood work. The engine was re-started by a stoker, who was not aware that there was any one about the bell crank, and the result that the crank crushed the deceased. 1906 August 7 Cauldhame Ayr Arch. Finnie & Sons Alexr Fulton 27 Fireman Shaft accidents - falling from part way down He fell 34 fathoms from a mid-working to the pit bottom. From Main body of report: Accidents from falling down the shaft from mid-workings are now comparatively of rare occurrence and happen very seldom indeed in cases in which the Special Rules relating to mid-workings are observed. One man lost his life from this cause during the year. The deceased, instead of asking the bottomer to signal for the cage for him to ascend, did this himself. The cage was raised to the mid-working, but he opened the wrong gate, and not noticing his mistake stepped into the open shaft and fell to the bottom. In this case there was a gate for each cage, but they were both connected by one wire to one indicator in the engine-house. Consequently the engineman could not know, as he ought, which gate was opened. 1906 August 8 Candlerigg-Broomfield No 4 Lanark James Nimmo & Co Ltd Robert Elder 28 Joiner On surface  miscellaneous Explosion of gelignite and gunpowder in a bothy. It was said to have been caused by the bursting of an old electric incandescent lamp which they were testing. From Main body of report: Caused the death of an overman and other two men, while another man was injured. Robert Elder, who had charge of the explosives, in coming from the magazine found an old electric lamp in a heap of manure and took it into the office along with a box containing 27 lbs of compressed gunpowder and two and a-half lbs of gelignite. It is stated that he and the overman took off the lamp in use and substituted for it the lamp which the former had found, and when the current was switched on the lamp burst, and apparently a piece of fused glass or wire falling into the box of explosives placed beneath the lamp caused the contents to explode. The four men present were all injured, and only one of them survived. 1906 August 9 Lanemark Colliery, Rigfoot pit Ayr Lanemark Coal Co Ltd Archd Haddow 41 Chain runner Haulage  run over or crushed by trams & tubs A race of full hutches, which he was taking out of a lye to go up a dook, went off the rails and crushed him against the side of the road. 1906 August 11 Wemyss Colliery private railway Fife Wemyss Coal Co Ltd Frank Robertson 27 Hutch mender Deaths not comprised under Mines Act While proceeding along the railway to his home in a state of intoxication he was run over by a train of waggons. 1906 August 13 Swinhill No 2 Lanark Darngavil Coal Co Ltd Jamieson Frame 22 Miner Falls of roof Fall of roof in working place where coal cutting machine was used. The fall crushed out the props. 1906 August 13 Hamilton Palace Lanark Bent Colliery Co Ltd Edward McCormack 29 Miner Falls of side Fall of coal. 1906 August 15 Dumbreck No 2 Stirling Wm Baird & Co Ltd William Ross 16 Bencher Haulage  run over or crushed by trams & tubs When attaching hutches on a dook to the haulage rope a full hutch slipped free from the jigger, ran back and struck another hutch which in turn struck him. 1906 August 20 Denbeath Fife Wemyss Coal Co Ltd John Birrell 59 shaftsman Shaft accidents - falling from part way down Deceased was employed with others enlarging a shaft from the bottom upwards, and while standing on a platform consisting of two planks fixing buntens he fell a distance of 14 feet, injuring his head, and subsequently died from the injury. 1906 August 22 Milnwood Lanark Coltness Iron Co Ltd Lewis Dillon 26 Pony Driver Haulage  run over or crushed by trams & tubs When walking between his pony and the front hutch of a ''race " a crown fell from the roof and he was crushed between it and the hutch. 1906 August 23 Fordell Fife Countess of Buckinghamshire John Lawson 45 Brusher Falls of roof Deceased was engaged with others in brushing a hard rock roof on a haulage road ; the rock was overhanging and unsupported and part fell and killed him. 1906 August 25 Cadzow No 1 Lanark Cadzow Coal Co Ltd Robert Easton 29 Roadsman Shaft accidents  falling into shaft from surface The engineman raised the cage a few feet above the pithead, seeing which Easton jumped off, but fell back and down the shaft. 1906 August 27 Douglas Park No 1 Lanark Wilson's & Clyde Coal Co Ltd James Graham 54 Miner Falls of roof Fall of roof in working place. 1906 August 29 Cowdenbeath No 10 Fife Fife Coal Co Ltd Robert Muir 33 Miner Falls of roof Deceased drove a narrow place through on the waste to ascertain the thickness of coal and also to obtain from the waste material for which to build the places, and while engaged afterwards near the entrance to the opening the roof fell right along the narrow place, and he was killed instantaneously. 1906 September 2 Houldsworth Ayr Dalmellington Iron Co Ltd Jas McDermont 62 Miner Shaft accidents  whilst ascending or descending by machinery While being lowered with other 13 men in the cage, the engineman lost control of his engine. The valve gearing being reversed, the cage on landing in the bottom was at once raised 13 feet. Scott was crushed between the cage and a beam at the doorheads, and McDermott was also either similarly crushed or fell out The oversman who was on the cage was injured. 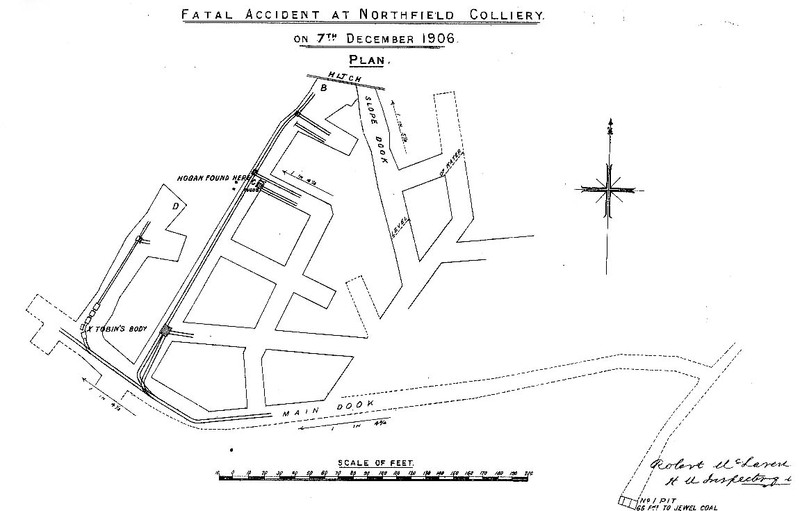 From Main body of report: By an accident at Houldsworth Colliery two men were killed and another was injured. The shaft is 205 fathoms deep, and on the morning of the accident 15 men were being lowered to their work in the "rise" cage. The following is the engineman's statement:"I had let down most of the men before the accident happened. In lowering men against an empty ascending cage I use steam for the first 30 fathoms. The cages then run to about the meeting point without steam, but with the foot-brake applied. I then reverse the link motion and use steam to assist the brake. On this occasion the steam acted all right as a brake until the cage got within 8 fathoms, or a stroke of the engines, of the bottom, when I noticed that the steam did not seem to enter the cylinders and check the speed. I had also a difficulty in opening further the steam valve. Just as the cage would reach the pit bottom I applied the steam brake and the cage stopped. The moment the engine stopped it started in the reverse direction, as the link motion was reversed and steam was on, and the rise cage would be raised 2 fathoms before I shut off steam and stopped the engine. The boilers sometimes prime, and I think water in the steam pipe prevented the engine from working properly." The cage was not damaged, and most of the men in it were not injured. One of the deceased and the injured man (the overman) were found in the cage seat, and the other man, who was killed, was found hanging over one end of the cage, having evidently been crushed by a beam when the cage was raised. Apparently the sudden raising of the cage from the cage seat was the cause of the accident. There was no evidence to support the engineman's statement that the priming of the boilers caused him to lose control of his engine. 1906 September 6 Blantyre No 4 Lanark Wm Dixon Ltd William Paton 16 Miner Falls of roof Fall of roof in working place. 1906 September 7 Lanemark No 2 Ayr Lanemark Coal Co Ltd James Nimmo 24 Chain runner Haulage  run over or crushed by trams & tubs In some unexplained manner he fell off a race being drawn up a dook and was run over by the hutches. The roof was too low to permit riding on the hutches with safety, and I suspect he was in the first instance caught by the low roof. 1906 September 14 Dysart Fife Earl of Rosslyn's Collieries Ltd Henry Allan 38 Labourer Shaft accidents  falling into shaft from surface The cleek had been standing for a short time and a signal to raise the men was given from the bottom. As the cage at the surface was loaded it was necessary in order to comply with the Special Rules that the descending cage should be empty, and accordingly deceased after giving a signal to the engineman,stepped on to the cage to take off the empty tub, when the cage descended and he fell into the shaft. The evidence at the Inquiry was very conflicting, but it appeared the engineman was at fault. 1906 September 14 Elphinstone Haddington R & J Durie Ltd James Rutherford 17 Drawer Falls of side Deceased was filling coal into a tub, when a stone in centre of seam suddenly burst off the face and killed him. 1906 September 17 Carnock No 1 Ayr Alloa Coal Co Ltd Jas McIlvenney 35 Miner Miscellaneous underground  by explosives After lighting the fuse of a gunpowder shot, he retired, but returned before it went off. It is thought that he was under the impression that a shot fired in an adjoining place was his, and he returned, when his own shot went off on him. 1906 September 18 Minto Fife Lochgelly Iron & Coal Co Ltd John McEwan 16 Drawer Falls of roof Deceased was filling coal into a tub, which had been holed the previous shift, by a coal-cutting machine, when a fall of roof took place and he was killed. 1906 September 21 Nellie Fife Lochgelly Iron & Coal Co Ltd James Henderson 32 Miner Falls of roof A roadway was being driven to work the coal to the rise of two large faults, and while deceased was taking off coal to widen the road a huge stone fell, killing him instantaneously. 1906 September 21 Cameron Fife Wemyss Coal Co Ltd George Morgan 26 Miner Deaths not comprised under Mines Act Deceased got the forefinger of his right hand scratched in some way and blood-poisoning set in, from which he died. It was stated he received the scratch while picking the coal off the face, but it was not possible from the position of the scratch. 1906 September 23 D'Arcy Limeworks Edinburgh Lothian Coal Co Ltd John Muirhead 13 Schoolboy Deaths not comprised under Mines Act This boy and some companions were amusing themselves on a Sunday by running tubs on the haulageway between the mine and kilns ; the tub ran away with them, and leaving the rails they were thrown out and deceased alighted on his head. 1906 September 24 Dumbreck No 2 Stirling Wm Baird & Co Ltd Thos O'Connor 45 Miner Explosions of fire damp or coal dust Apparently the " working " of the roof caused an emission of fire-damp, and it ignited at his naked light. Another man was injured. From Main body of report: The other fatal explosion occurred in Dumbreck No. 2 Pit, Stirlingshire. The roof began to "work" in the working place of two miners and they retired, and after waiting a few minutes they returned, when one of their naked lights ignited gas, which the breaking of the roof had released. They were both injured by the explosion, and one of them succumbed to his injuries. 1906 September 24 Stane Lanark Kepplehill Coal Co Ltd Henry Boyle 46 Fireman Deaths not comprised under Mines Act Deceased and another were doing some repairs on a level road, and while preparing to put up a set of timbers a crown above him fell and injured him. He met his injury on 12th .September, 1905. 1906 September 26 Dalmeny (Oil shale) Linlithgow Dalmeny Oil Co Ltd Patrick Kane 21 Drawer Falls of side Deceased was going outbye with a loaded tub, when a piece of shale fell away from the side, and striking him, caused injuries to which he succumbed about three hours later. 1906 October 4 Blackhill No 9 (ironstone) Lanark Summerlee Iron Co Ltd David Taylor 40 Repairer Miscellaneous underground  sundries When taking a coal cutting machine off a bogie it slipped and crushed him, the chain holding it having become detached. 1906 October 4 Broxburn (Oil shale) Linlithgow Broxburn Oil Co Ltd George Shanks 32 Miner Miscellaneous underground  by explosives Deceased was found 16 feet from his working place injured on the head by being struck with flying shale from a shot. The shot was in the bottom portion of the seam, and was charged with 1 lb. of gunpowder, and it appeared deceased had been delayed after the fuse was lit and failed to reach a place of safety when the shot exploded. His lamp was found near the shot, which indicated that probably the light had been extinguished by the spitting of the fuse, and he had dropped it and put off some time searching for it. 1906 October 4 Carberry Edinburgh Edinburgh Collieries Co Ltd John Horner 17 Drawer Shaft accidents -things falling from part way down The shaft is 137 fathoms deep, and at 75 fathoms from the surface is a steam pump in the dip side, and for expansion a copper pipe was placed some distance above. While the men were descending to their work in the morning an unusual noise was heard in the shaft, and the oversman, thinking a joint had blown, signalled to the surface to cut off the steam, after which the men were again allowed to descend. The dip cage was loaded with seven persons, and while it was descending it came into contact with something and shortly after a piece of wood followed, and a splinter struck deceased, penetrating the skull by the eye, from the effects of which he died next day. It was afterwards discovered that the expansion pipe had burst and the force of the steam had displaced a brattice deal opposite, which the cage caught in passing. Had the oversman made an inspection of the shaft after the explosion before he allowed the men to descend he would have discovered the loose deal. From Main body of report: Accidents was caused in rather a peculiar way. While the men were descending for the morning shift, a noise was heard in the shaft, and as steam pipes were in the dip side to work a pump, it was thought that the noise was occasioned by a blown joint, and winding was suspended until the steam was cut off at the surface ; when this had been accomplished the dip cage was loaded with men and began to descend, and when about 72 fathoms down the cage met, and apparently passed, an obstruction, and something fell after the cage, and in passing came into the cage, striking a lad, causing injuries to his face from which he died. An examination of the shaft afterwards showed that the noise was caused by an expansion pipe bursting, and the force of the steam had displaced a wooden deal for bratticing off a compartment for ventilation, and the cage in passing had forced it away from its position, and a splinter off the deal caused the injuries. 1906 October 5 Hopetoun Linlithgow Wm Baird & Co Ltd And. Galbraith 6 Child Deaths not comprised under Mines Act The child crawled through the fence surrounding an old disused shaft and fell into it and was drowned in 11 fathoms of water. 1906 October 5 and 11 North Motherwell Lanark Merry & Cunninghame Ltd John Morton 32 Miner Miscellaneous underground  sundries While working at the face on the first date a splinter of coal flew from his pick into deceased's eye but he continued to work; again 6 days later the same thing happened, causing trouble on the brain from which he died three days later. 1906 October 8 Bridgeness Linlithgow Bridgeness Coal Co Robert Muir 32 Brusher Falls of side Deceased was engaged cutting a roadway through a waste, and was about to stamp a hole in the brushing for a shot when the roof fell. The stone fell away by a lype in front and a waste break on the side, a stay was placed against it and a prop under it, but both were thrown out when it fell. 1906 October 9 Grangemouth Stirling Grangemouth Coal Co Ltd David Laird 28 Attendant on coal cutting machine Miscellaneous underground  by machinery A coal cutting machine of the bar type, and driven by electricity, was put into a seam 23 ins. high, and deceased had charge of it. To turn the machine and allow the cutter to work in one direction it was being hauled along the face by its own power with the bar parallel to the face and revolving, and by some means deceased's shirt was caught by the picks on the bar and he was instantly disembowelled. 1906 October 17 Minto Fife Lochgelly Iron & Coal Co Ltd Archibald Bowman 26 Railway fireman On surface  railways, sidings or tramways Deceased was engaged on shunting operations in the colliery sidings, and while putting down the brakes of the waggons he fell among the wheels, and the moving train passed over him. 1906 October 20 Darngavil Lanark Darngavil Coal Co Ltd Charles Waugh 29 Attendant on coal cutting machine Miscellaneous underground  by machinery A recess had been cut in the coal at the dip side of the run to begin cutting, and disc of coal cutter had been placed up to the coal; deceased who had charge, was next to the disc and gave instructions to two men assisting to push the machine forward when the electric current was put on, as soon as the machine started and the disc struck the coal it sprang back, and the picks caught his head inflicting terrible injuries. The haulage rope was not taut nor was the machine properly skidded and what happened was only what might be expected when the machine was to cut up hill. 1906 October 22 Prestonlinks Haddington Forth Collieries Ltd Edward Quirk 29 Hammerman Deaths not comprised under Mines Act Deceased was subject to epileptic fits and took one at his work and died. 1906 October 23 Gilbertfield No 2 Lanark United Collieries Ltd William Glen 45 Miner Falls of roof Fall of roof in working place. 1906 October 24 Lochhead Fife Wemyss Coal Co Ltd Johnstone Chalmers 52 Miner Falls of side Deceased was engaged taking out some old stoops, and he passed round the stoop side to take off some loose coal, when a mass of coal fell upon him. 1906 October 25 Cranrigg Colliery, Broomfield No 4 Lanark James Nimmo & Co Ltd Andrew McCormack 32 Miner Shaft accidents  whilst ascending or descending by machinery While ascending the shaft he got crushed between the cage and a beam at the pitmouth. He is supposed to have been stepping off by mistake at a low scaffold. 1906 October 27 Auchinreoch No 1 Stirling Wm Baird & Co Ltd Charles Wilson 23 Drawer Haulage  run over or crushed by trams & tubs While taking a full hutch down a heading he was run into by a runaway hutch, of which another drawer lost control, owing to a snibble coming out. 1906 October 31 Tranent Haddington James Waldie & Sons Thos Cuninghame 10 Schoolboy Deaths not comprised under Mines Act While the colliery locomotive was approaching the weighbridge with a train of loaded waggons the boy attempted to jump on a waggon of the moving train, and missing his hold fell on the rails and the last waggon wheels passed over him. 1906 November 2 Lochside Fife Lochside Coal & Clay Co George Ritchie 35 Miner Falls of roof The blaes in the openings of the old stoop and room workings is worked for the purpose of making bricks, and while deceased was shovelling, an overhanging piece of the blaes fell and fatally crushed him. The part did not seem to be sufficiently timbered. 1906 November 2 Newton Mine (fire clay) Renfrew Robert Brown & Son Ltd James Simpson 28 Miner Miscellaneous underground  by explosives He was firing two gunpowder shots, and thought he only lighted the fuse of one. On returning after one shot went off, the other went off on him. 1906 November 12 Birkrigg Lanark Darngavil Coal Co Ltd James Goodwin 16 Labourer On surface  miscellaneous Struck by a piece of iron projected by a shot of gelignite used to break up an old spur wheel. 1906 November 14 Kingseat Fife John Irvine & Son James Johnstone 29 Miner Falls of roof While deceased was at work at the face the roof suddenly fell and killed him. The roof was composed of strong sandstone and was full of breaks. 1906 November 15 Polmaise No 4 Stirling Archd. Russell Ltd Hugh Jackson 40 Brusher Falls of side He fired two shots in a road which he was enlarging, and, on returning, a stone from the side fell on him. 1906 November 16 Lumphinnans Fife Fife Coal Co Ltd Andrew Clark 36 Sinker Shaft accidents - falling from part way down The shaft was being enlarged and deceased was on a suspended platform 10 fathoms up helping to fix a bunton when he overbalanced and fell to the bottom. 1906 November 19 Newbattle Edinburgh Lothian Coal Co Ltd John Smith 69 Pumper Deaths not comprised under Mines Act Owing to repairs in the shaft deceased was unable to descend and went to go to work a pump, of which he had charge, by an in-going-eye from the surface ; he did not get to the pump, and was missed for a day and search was made, when he was found at the entrance to the in-going-eye quite dead ; his death was due to natural causes. 1906 November 29 Garriongill Lanark Coltness Iron Co Ltd John McPherson 48 Miner Falls of roof Deceased was taking off coal at the face when a stone fell from the roof, and fatally crushed him. On the left-hand side was a visible "lype," and the stone fell away from this, and one inside which was invisible. 1906 December 3 Kilgrammie Ayr David Robertson David Shields 40 Miner Haulage  run over or crushed by trams & tubs While being lowered with other six men in a "race" of four hutches down a dip mine three hutches got uncoupled and ran down the incline. Other three men were injured. From Main body of report: The second inrush took place at Northfield Colliery, Prestonpans, in the workings of the Jewel Coal seam. A slope dook was driven in the seam and stopped on a hitch in July, 1905, and in the interval it naturally filled with water. Operations were pushed on further to the dip, levels driven and places run to the rise in the direction of the slope dook. The same hitch met with in the slope dook was struck in the level B, where deceased worked, and they were instructed to work to the rise in the same direction as the line of the hitch, and while Hoggan was apparently holing at the face the water burst out the coal, which struck him, and he was borne along with the force to C, where he was afterwards found. Toban, who with another drawer, was filling a, tub with coal at B, got into the flood and was carried right to the main dook and was drowned. The men who worked in the level D and upset, had great difficulty in reaching a place of safety, and to get to level road above had to keep close by the left side of stoop. The manager and officials were aware of the water in the slope dook, and the former was of opinion the quantity was not dangerous, and did not put the provisions of General Rule 13 into force. At the Fatal Accidents Inquiry held subsequently the manager stated that having met with an injury he was unable to go underground for ten days prior to the accident to superintend operations. This did not appear to me to be a valid reason for the non-compliance of the rule, as a narrow place with bores should have been begun weeks before. A calculation of the cubic space occupied by the water in the main dook after the burst showed that quantity of water was about 54,000 gallons, and that it filled the slope dook for a distance of 105 feet, giving a statical pressure of 8.3 lbs per square inch. The total pressure, on the piece of coal displaced and which struck Hoggan, was fully four tons. Proceedings were taken against the manager for a contravention of General Rule 13, and he was convicted, but the Sheriff let him off with an admonition. 1906 December 10 Wallyford Edinburgh Edinburgh Collieries Co Ltd William McKinlay 23 Miner Falls of side Deceased was holing in the bottom coal, when the head coal suddenly burst and a part fell upon him. 1906 December 11 Gilbertfield Lanark United Collieries Ltd Thos Scobbie 21 Engineer On surface  by machinery While inside a dross conveyor, repairing it, the engine was started and he got caught. From Main body of report: The third fatal machinery accident resulted in the death of the manager's son, who, with his father and others, was engaged repairing a dross conveyor. They were inside the conveyor when the engine started. The others escaped, but the deceased was caught and carried over the driving drum. Owing to the thread of the spindle of the steam stop valve having become "stripped," the valve could only be kept closed by jamming a piece of wood between the wall of the engine house and the valve spindle, and it seems that this piece of wood was accidentally knocked away by a boy, with the result that the engine started. 1906 December 11 Shotts Lanark Shotts Iron Co Ltd Duncan Russell 31 Contractor drawer Haulage  run over or crushed by trams & tubs The system of haulage is endless rope, speed 2 1/2 miles an hour. The tubs are conveyed in rakes of ten with a bogie in front, and rope is attached by means of a gripper or "shears." The haulage road is 1,400 yards long and worked by bogie boys between the mid bye and the shaft, a distance of 1,200 yards, and from the mid bye deceased bogied the tubs to and from the inside or inbye lye. When the rake had not reached the mid lye, his custom was to go on with his loaded rake until he met the incoming rake and a transference took place. On the occasion on which the accident occurred he met a bogie boy 700 yards outbye from the mid lye, and, as usual, handed over his rake to the boy to proceed to the shaft, while he took the empty rake toward the inside. About 15 minutes afterwards another bogie boy was proceeding inbye with an empty rake when his bogie collided with the rear of a rake in front, and deceased shouted for help ; he was found on the opposite line of rails under the tubs, and the bogie was partly over to the empty side and free of the rope ; his injuries were serious and he succumbed three days later. The accident was due to the rake having run amain and some of the tubs left the rails, and at a lower part of the pavement than usual the bogie and tubs were thrown to the opposite side, and deceased was pitched out;. the track of a derailed truck was discovered for 150 yards. The plane is undulating and for 300 yards dips inbye 1 in 14, and it appears deceased released the rope from the "shears" and allowed the rake to run free inbye. 1906 December 12 Rosie Fife Wemyss Coal Co Ltd William McLean 46 Miner Other haulage accidents Deceased was lifting a loaded tub which had left the rails, and in doing so he slipped and fell, injuring his side. He continued to work at irregular intervals for some time afterwards, but eventually became very ill, and died on 10th August, 1907. 1906 December 13 East Plean No 4 Stirling Plean Colliery Co Ltd John Coyle 22 Labourer On surface  railways, sidings or tramways While jointing water pipes in a track crossing the siding he was run over by eight full waggons propelled past the screes by a Caledonian Railway Company's locomotive. From Main body of report: Three fatal accidents were caused by waggons while being shunted by the Caledonian Railway Company's workmen. At least one of these, that at East Plean No. 4 Pit, ought not to have happened if ordinary care had been observed by the Railway Company's servants. The deceased was laying a water pipe in a track crossing the rails close to the screes, where the machinery makes a good deal of noise. After marshalling eight loaded waggons, the locomotive driver, after sounding his whistle, proceeded to propel them past where the deceased was working in the pipe track. Instead of one man being in front while passing the screes to see that the road was clear, the two guards were on the engine along with the driver and the stoker, and the consequence was that the deceased was run over, he having apparently failed to hear the whistle on account of the noise of the screes, or to see the waggons approach. Proper regulations with a view to prevent accidents and applicable to railway company servants while shunting on mine premises are very much required. The ordinary printed railway regulations in force are not sufficient for the purpose. With the increased use of noisy machinery at the pithead, there is greater danger of accidents by moving waggons to men at work about the screes. It would tend to prevent such accidents if a steam whistle, which all could hear, were to be blown before any waggon was moved at the screes or brought forward to them, and if waggons were not brought forward unless some one went in front to see that the road was clear. 1906 December 14 Newbattle Edinburgh Lothian Coal Co Ltd William Gardner 55 Locomotive driver On surface  railways, sidings or tramways Deceased was on the colliery engine moving a train of loaded waggons across the weighbridge, when an engine and van belonging to the North British Railway Company came in to lift a train load of waggons for shipment, which stood on another line; by a mistake the wrong points were opened and this engine crashed into the colliery engine and crushed deceased so seriously that he died 30 minutes later. The points were opened by a railway inspector, who was not empowered to do so. From Main body of report: Three of the persons killed were men who were well acquainted in the duties of working among waggons. One case was of a particularly sad nature, the colliery locomotive was moving a train of loaded waggons across the weighbridge, when a locomotive belonging to the railway company crashed into it and the driver was fatally injured, the latter by a mistake on the part of a railway official had been shunted into the wrong road. 1906 December 20 Dalzell & Broomside Lanark Wishaw Coal Co Ltd Robert McMillan 21 Coal-cutter machine man Haulage  run over or crushed by trams & tubs Deceased had worked a double shift, and when he arrived at the mine bottom, after his work was over, the oversman was sitting on the first tub of the loaded haulage rake to be raised to the surface ; he asked and obtained permission to ride with him, and while the rake was moving up the plane his head came in contact with the roof at a low part and his spine was fractured, death ensuing 26 hours later. The mine starts from the surface dipping 1 in 3 most of the way, and the system of haulage is by a rope on a drum, and while the loaded rake ascends the empty descends : speed about 4 miles an hour. 1906 December 20 Wallyford Edinburgh Edinburgh Collieries Co Ltd John McCutcheon 16 Drawer Falls of side Deceased and another drawer were proceeding to the top of an incline with a loaded tub, when it was stopped by some debris, and he was making his way round the tub to clear the obstruction, when a stone fell away from the high side and crushed him against the side of the tub. The stone came away at a part of the road where a "hitch" was crossed. 1906 December 21 Simpsonland No 2 Lanark United Collieries Ltd James McGinty 39 Roadsman Falls of side While descending the shaft, after repairing some defect, the barring gave way 12 fathoms them and some 50 tons of debris fell from the side of the shaft upon the cage. 1906 December 24 Hawkhill Fife Kincardine Coal Co Ltd David Hunter 40 Miner Miscellaneous underground  sundries Report, page 19. From Main body of report: This accident occurred at Hawkhill Colliery, Fife. The machine in use was a disc worked with a voltage of 450 and continuous current of electricity. The height of the working was 2 feet 9 inches to 3 feet and across the run of 190 yards the face was wet from roof and floor. Owing to the nature of the seam difficulty was experienced in keeping the faces in a straight line, and a man was employed to go in front and take off projections of coal to allow the machine a free and uninterrupted run. On the night of the accident the machine was cutting as usual and deceased was in front about 30 yards from the machine taking off a "nose" of coal, and another man was close by boring holes for blasting down the coal when suddenly the machine became alive and the electric current ran along the haulage rope, and deceased, who apparently was sitting on a part of it, was "shocked" and thrown across both parts of the rope, while the man beside also received a shock but was thrown toward the face clear of the rope ; he at once called the attention of the man in charge of the machine to switch off, and in attempting to do so he was thrown down, and the current remained on until one of the men ran to the latch box and cut it off. Deceased was then removed to a convenient place, and artificial respiration applied for about two hours, but he did not recover ; the body of deceased was wet owing to the water from roof and on floor. An examination of the machine was afterwards made, and it was discovered that the cable going through the machine casing to the field magnet coil was bare inside the bushing and had come in contact with the metal of the casing causing the machine to become alive, and all the parts connected as well. The cable was insulated in the usual way and was inside rubber tubing, right to the inside of the casing of the machine: it passed through the casing by a brass bush and small rubber ring screwed tightly up, apparently the cable had received rough usage to cause it to be bared in the inside of the casing. 1906 December 25 Broomrigg No 3 Stirling Banknock Colliery Co Ltd John Howden 60 Miner Falls of roof Fall of roof in working place, which was not propped as required by the rules. 1906 December 25 Milburn Lanark Archd. Russell Ltd Robert Dewar 35 Miner Falls of roof Fall of roof at working face. 1906 December 28 Benarty Fife Fife Coal Co Ltd Michael Thomson 38 Miner Other haulage accidents A brae wheel was fixed and when it was put into operation it stuck, deceased went to release it and met with an accident. He died on 24th April, 1907.